Ever since the early 1990’s, Las Vegas online poker rooms have sprung up all over the Internet. And if you are unable to make it to Vegas, they provide decent options. But there is nothing like the incredible sensual experience of traditional Las Vegas poker rooms. The sounds of the players stacking and shuffling their chips, the beautiful casinos, and sitting at a table with celebrities and players from around the world testing your mental skills against them. You can only get that experience in a physical poker room, and only in Las Vegas. The first World Series of Poker in 1970 had only seven entrants, and today thousands of hopeful amateur and professional card players from around the world descend upon the land based poker rooms in Las Vegas, Nevada for the WSOP every year. But you do not have to wait until that singular event to enjoy the best that Vegas poker rooms have to offer. Cash games, sit ‘n go play and tournaments are offered in brick and mortar poker rooms all around the world, but there is only one Las Vegas, baby. That is where the best aspiring and professional poker players live and work, and for US players as well as international gamblers, there is simply no substitute. And you never know when a simple trip to one of the poker rooms in Las Vegas will turn you into a poker legend. In 1974 a 22-year-old on his way to Stanford University law school decided to stop in for some low stakes poker in Vegas. With a very meager $400 bankroll, Chip Reese had within days turned that money into $60,000. Needless to say, law school never happened. But once again the unique experience of a brick and mortar poker room in Las Vegas worked its magic, and Reese is now considered one of the greatest poker players of all time. Las Vegas poker rooms deliver the unique physical experience of being able to stay where you play. Internet poker is great, but can never deliver the “real world” sensory rewards that a Sin City poker room visit can. And whether your game is crazy like Razz or HORSE, traditional like 5 card and 7 card stud, or more currently popular like Texas Hold ‘Em, all game variants are offered at the more than six dozen major casinos that Las Vegas offers. And remember that a Las Vegas poker room puts you within minutes of world-class dining and nightlife, delivered like only Las Vegas can. If you are thinking about checking out one of the many famous poker rooms in Las Vegas, you will also get the added benefit of the sights, sounds and entertainment that this truly unique city offers. There are world-class gambling cities located across the globe, but none rival the incredible Las Vegas experience. Add the ability to play your favorite poker games any time night or day, in tournament, cash game or sit ‘n go offerings, and you have the perfect Vegas combo. Play is provided for professionals and amateurs alike, beginners and veterans, and you never know when a simple trip to a brick and mortar Las Vegas poker room can deliver poker immortality. You can read more about Las Vegas poker tournaments here. Are you traveling to Las Vegas and want to know the best places to play poker? No sweat, check out our top 10 vegas poker rooms to play in Sin City. I bet you won't find a brick and mortar poker room in vegas that will double your bankroll when you walk through the door? 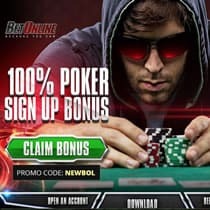 This is exactly what Betonline poker site does for you, so the smart players know to take advantage of these kind of offers. BetOnline accepts players from all 50 U.S. States. Finally players are able to play online poker legally if they reside in the state of Nevada. WSOP is one of the biggest brands in poker, and currently has a generous $400 matching bonus for new players that make their first deposit.